Take the challenge out of choosing paint, using color psychology. Most homeowners talk about painting their home in vibrant, new coats of paint. Would a sea foam green finally make the living room feel complete? What about your favorite shade of lavender for the master bathroom? Sometimes, the indecision can end in simply leaving the walls white. To help you make your decision, consider how color affects mood before committing to that gallon of rich red paint. You do not want to coat your walls in regret, after all. Color psychology is not as simple as disapproving of a particular shade or color. Ever notice that most restaurants use yellows and reds? Or why a roof cleaning company may use greens and blues? 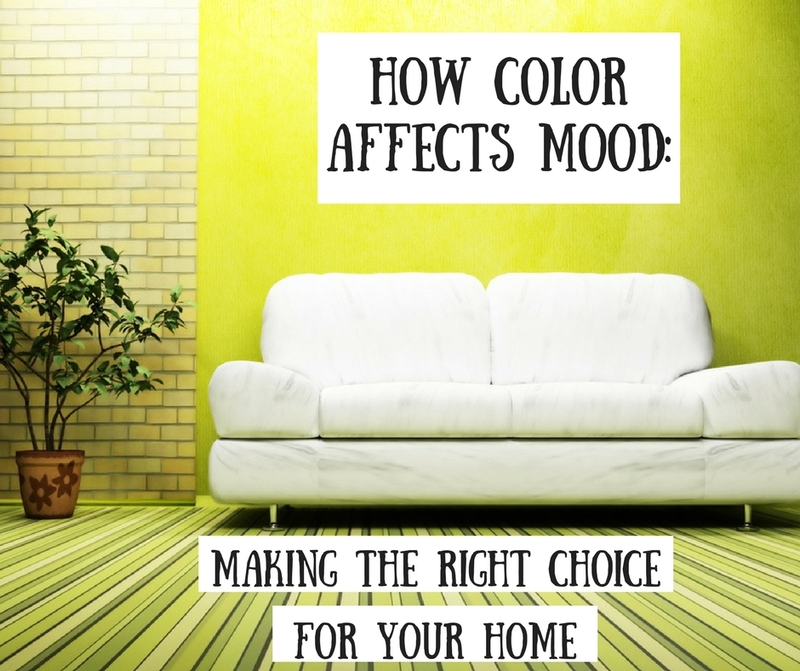 Ample research has gone into how certain colors can affect temperament, trust and even physiological processes. This impact can be equally apparent in a home. Colors can have an active, passive, or neutral response on behavior. The darker the hue the more pronounced the effects will be. Light neutrals, like tan and gray, will have little to no effect on someone, at the risk of coming off a bit boring throughout an entire home. Bold oranges and deep blues will tend to have a much more dramatic impact. That’s not to say that the colors are absolute when it comes to their effects! What works in one room of the home can have opposite effects in the other. Greens and blues have a universal appeal, depending on the shade. However, other colors have very specific designations. Feeling Blue- Blue is generally one of the most favored colors in the spectrum. When people decide to paint, shades of blue can be found all over the average home. In an office, blue can help boost productivity. Lighter shades are often associated with cleanliness. This makes it a great choice for the bathroom without the sterile appearance of pure white. In a bedroom, blues help create feelings of relaxation. Be sure to keep blue out of the kitchen. Its tranquil properties tend to reduce appetites. That is the last thing you want associated with your kitchen. It’s Easy Being Green- Green is usually associated with tranquility and health. You will most often find this color in bedrooms. However, as a color commonly associated with feelings of balance, many design-savvy homeowners have taken shades of green to every room of the home. Ask any professional painter: green is in. Pretty in Pink– While usually reserved for a little girl’s bedroom, pink is finding its way into living rooms, dens, and other entertainment rooms. In direct contrast with its deeper shade, red, pink provides a warm sense of relaxation. Use this in areas where it is most likely for crowds to gather. Not so Mellow Yellow- Growing tired of your tiny kitchen? Paint it yellow! Yellow has a tendency to make small spaces appear larger, caused in part by brightening the space. Take note of this if there are little to no windows near your kitchen space. It is also linked to an increased metabolism, which helps to encourage eating. Be careful, though. Too bright of a yellow can cause eye strain, cause an emotional disturbance in infants. Some feel it puts off a childish mood. Have painting contractors assist you with picking a universally appropriate shade for your room. La-La-La-Lavender- Purples are tricky to work with. As a color that does not appear all that often in nature, it can be a bit overbearing as the major color on the walls. Lavenders are the exception. This color, like its namesake plant, calms nerves and promotes relaxation. Use this in your calmest areas, like a living room or bedroom. Even give your bathroom a luxurious upgrade with the addition of lavender. When it comes to plum and eggplant shades, save those for the accidents. They are typically too dark to be comforting in an entire room. Seeing Red- Red is the color you need to be the most careful with in your home. It encourages appetite, so you find it usually in kitchens and dining rooms. However, the color red is linked to high blood pressure, increased aggression and tension. If you have a lot of sit-down dinners, you may want to stick to red accents, rather than surrounding you and your guests in it. Emotions aside, too much red can be reminiscent of an old fashioned dinner or fast food establishment, so be mindful with the décor. If you work from home, keep red out of your workspaces. It tends to decrease productivity! Orange You Glad – As a bright and bold color, you would think that finding a good place for orange in your home would be a major challenge. Not so much! If you have a workout room, spring for Orange walls for a boost of energy. Are you or someone in your family asthmatic or suffer from other breathing issues? Paint the bedroom walls orange. Research shows a link between the color orange and improved lung function. Before choosing paint based on how color affects mood, be sure to recognize a few other interior painting guidelines. For a balanced home life, you want to keep your high-traffic and social areas separate from your quiet, retreat areas. Choose cool colors to foster the relaxing temperature. Turn the temperature up on the entertaining spaces to boost the room’s energy. While there is nothing wrong with picking neutral shades for your home, such as white, tans, and grays. That said, keep close attention to the accents when painting and decorating the room. These will be the deciding favor in developing the mood. Choose with caution. Black makes for a great accent, but if you make the bold choice to use it as a solid interior color, be sure to choose a glossy finish. This will help to prevent the room from feeling too small. The shine will also help cut down on the melancholy mood often experienced by people who spend ample time in dark gray or black rooms. Stick to these tips and you can, quite literally, design the feeling of your own home. Learning how colors affect mood will have a lasting impact on your family and all who visit. If you are still stumped on what colors to choose for your home, consult an interior painter. The Paint Manager is there for all your residential painting needs.